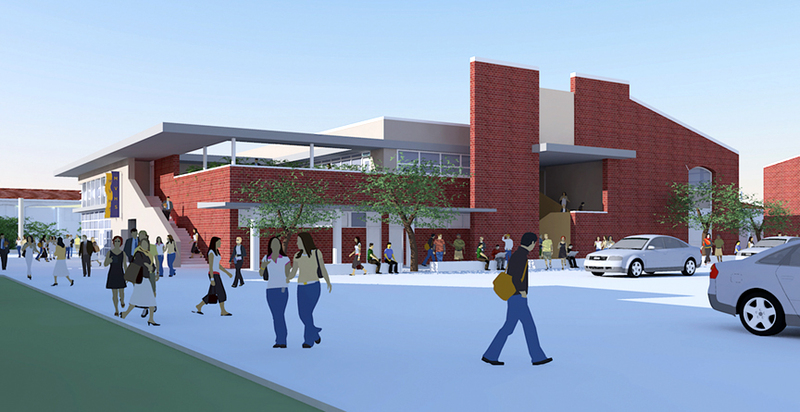 ﻿The design team’s challenge for the new Library - Media Center was to add a new library to an existing high school campus. The building had to fit within the last available site on the campus: a site that was bordered by buildings on three sides, a vehicular drop-off area and main street, and a large heritage oak tree in the center. A planning committee comprised of high school administrators and teachers, as well as District level staff, was established to study and evaluate various planning options. Along the street side, the building takes cues from the existing masonry buildings. The masonry walls maintain the scale and fenestration pattern of the street elevations of the existing buildings, while glimpses of a clerestory window and suspended overhang suggest something very different beyond. 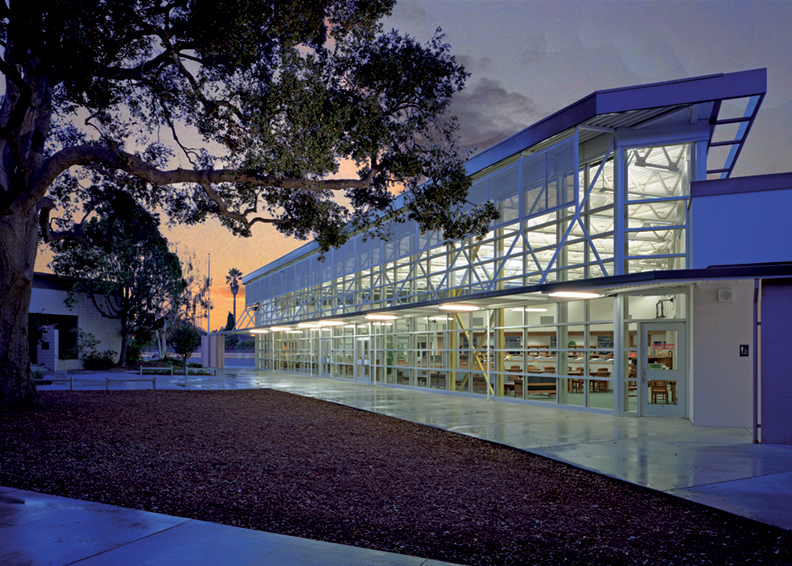 ﻿An existing high school library occupying a prominent, central location within the campus needed to be enlarged and updated to meet the district’s new guidelines for an Information Learning Center (ILC). The transformation from a traditional library to the new ILC took place both in how the building was used and how it would look. The existing library was dark, with low ceilings and few windows. Students preferred to gather outside the library instead of inside. The idea was to create a place that would promote gathering, socializing, and learning opportunity both during and after school hours. The design for the Student Center combined the classroom and cafeteria needs into one multi-story building nearly matching the original cafeteria footprint. At the campus side, the building reaches out into the large, existing quadrangle with an amphitheater that descends from the second-floor patio. The area beneath the patio creates a covered queuing area for students to enter the cafeteria and a place to host outdoor events like their beloved barbecues. A series of fabric sails provides shade for the amphitheater and tables in the quad. Large folding glass doors at the Student Center provide natural daylighting and easy access between the interior and exterior spaces. The teachers and staff have an outdoor patio area on the second floor level with a stair providing direct access from the adjacent administration building. Brick veneer-covered forms, reminiscent of the existing buildings, allow the Student Center to feel comfortable with its surroundings. 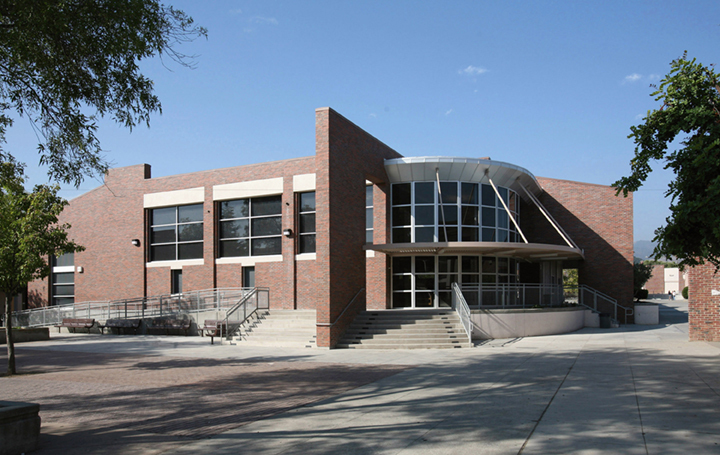 Centered within the campus between the main drop-off and the center quad, the building massing and the contrasting brick and glass volumes provide an exciting presence and focal point to the campus.